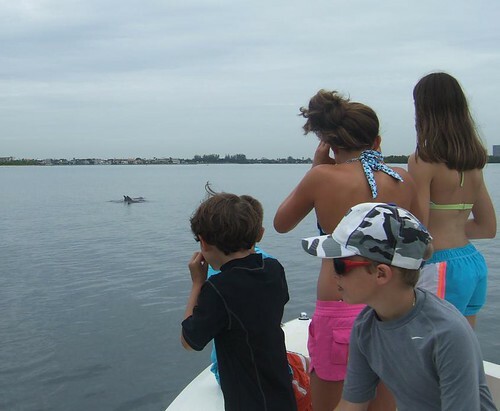 Boating, Fishing and Snorkeling FUN!!! I just wanted to drop a quick post about the weeks Adventure. Let me tell you, it has been another great week full of fun and excitement, and non stop adventure! We’ve had FUN, FUN, FUN all the way from Here to There!!! The whole week thru!!! It just doesn’t get any better than that!!! And I know, I’ve said that before!!! I started out this week with just another absolutely wonderful, great group of kids raring to go!!! They were ready to go have FUN, and so was I!!! And they stayed that way the whole week thru!!! Just the way I love it! We quickly loaded up, and off to the Rock Garden we went. The tide was high and the water absolutely beautiful! What a great way to start the day!!! There were menhaden by the thousands and dozens of big snook and juvenile barracudas were trying to eat them for lunch, right up next to the beach! It was darn exciting watching those menhaden race past us with some big fish right after them! It didn’t take long for AdventureMatthew to join the race and try to catch a few in his net as well!!! Way to go Buddy!!! Keep Chasing!!! While we swam around the Rock Garden enjoying ourselves and checking out the hundreds of species of fish, one big giant ray came gliding right up next to us that was truly awesome!!! It had to have about a 6 foot wingspan and as it glided past us, it looked like a 747 going down the reef! It was absolutely GREAT, and we all loved it!!! It was cool to see!!! 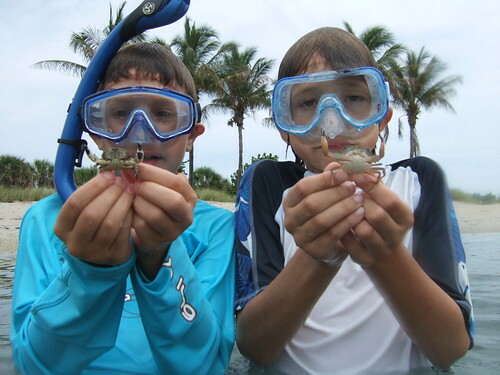 We spent a good bit of time searching for and finding blue legged hermit crabs by the hundreds! 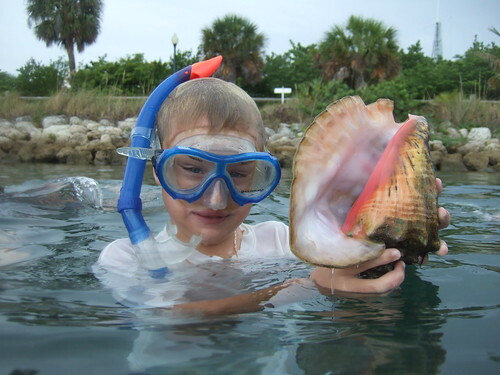 Along the way, we found one big, beautiful, mature queen conch that was about as nice as you can find around here. It was a nice find and we all took turns taking our photos with it. AdventureTripp sure had fun when it was his turn!!! We spent a little bit of time swimming around the lagoon on Peanut Island, and saw a manatee go by, found a school of reef squid hovering in mid water that were really great to watch as they changed colors by contracting and expanding their chromatophores.We found dozens of large short spined and variegated sea urchins that were totally covered with shells and algae. We came upon a nice rock that had a half dozen big lobsters underneath waving their antennae’s at us as if to say hello! 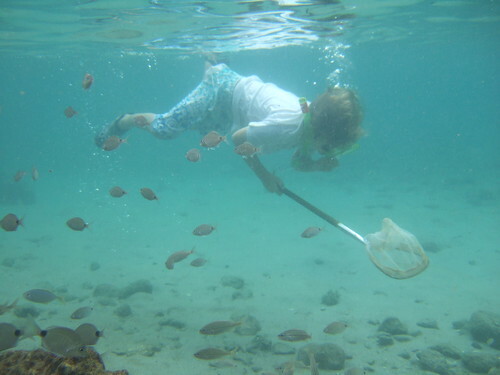 AdventureDylan and Beau caught dozens of rock crabs and swimming crabs, and had fun feeding a few to the friendly sheep head and parrotfish that were following us around. On the way back to the boat we found some small sea cucumbers and big tunicates, and at least a half dozen Giant Hermit crabs that were just waiting to crawl right out of their shells and grab your fingers if you gave them half a chance!!! There was nothing shy about these guys!!! The very second you grabbed their shell, they would stretch way out and try and reach around and take hold of your finger! It was just GREAT and EXCITING too trying to hold those crabs with getting pinched! AdventureDylan sure payed close attention to this one when he held it up for a picture!!! Nice Job!!! Didn’t get pinched either!!! Way to go!!! Each time we went by the Big Sandbar we put out a line with a shiny “Gotcha” plug and trolled along the shallows. 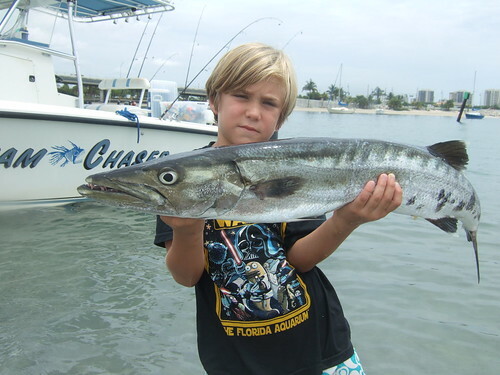 A few times during the week a big barracuda would grab it, and we would all take turns reeling it in. A few we kept for our crab trap, and others to use as bait for our set line hoping to catch a small shark or a big ray! We didn’t have any luck this week on the line, but we sure had fun on the way there to check it out just in case! Sometimes anticipation is everything!!! AdventureMatthew sure had FUN when it was his turn to reel in a nice big barracuda!!! Everyday at low tide we stopped by the Big Sandbar to explore and see what we could find. 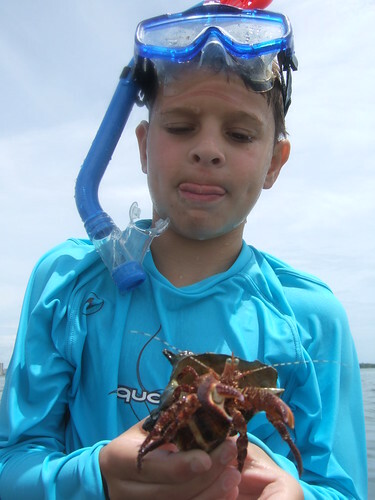 We found hundreds of West Indian and Florida fighting conchs laying eggs, dozens of Baby Ear mollusks and olive snails, quite a few juvenile box crabs and blue claw crabs and a few nice, big, short-spined sea urchins and beaded starfish. 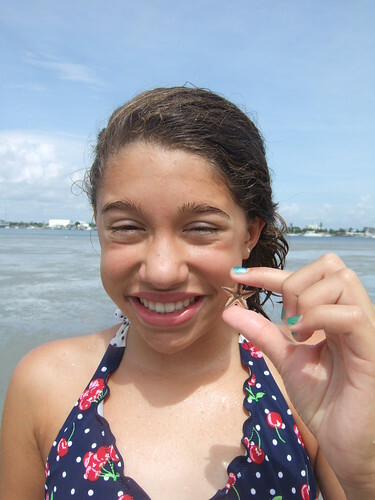 Along the way AdventureRachel and Davina found the smallest, most tiniest beaded starfish that I’ve seen all year! It was a really nice find and we all took turns taking pictures of that tiny starfish as well. AdventureDavina was sure full of smiles when it was her turn to check it out!!! Way to go girls!!! 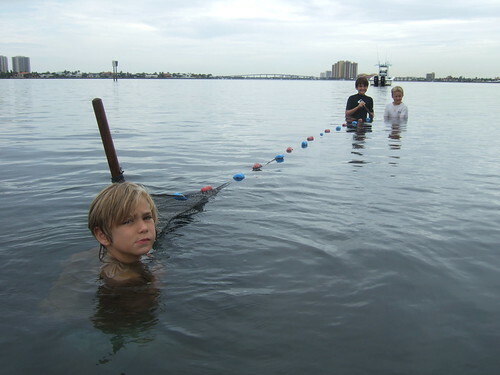 Everyday we would check out our crab trap to see if we caught anything and to add a bit more bait. Some days we would have nothing, and other days we would have only spider crabs. One day we had a trap full of some of the biggest, meanest blue crabs you ever saw!!! I’m talking CRABS WITH ATTITUDE!!! And thats just the way we love it!!! 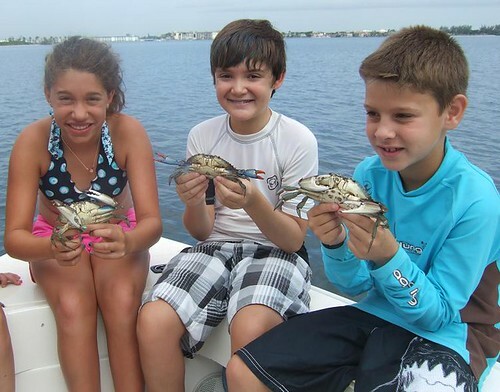 I gave the kids a talk on how to hold a “big mean blue crab full of attitude”without getting pinched, and showed them the proper technique that works everytime!!! I could tell they paid close attention too the way they tamed these big ol’ Crabs!!! Nice job!!! Nobody was “crabby” here!!! We stopped by Little Munyon Island a couple of times this week to look for horseshoe crabs and 9 armed starfish and to do a little bit of searching and exploring along the shallows on the backside of the island. We found loads of green legged hermit crabs and a few juvenile starfish that had most of the tips of the arms nibbled off by crabs. Probably by those very same ‘big mean blue crabs with attitude”!!! Most of the tips had begun to regenerate and that was cool for the kids to see! We stopped by the south end of the island to take a couple of group photos along the edge of the rocks, where everyone had fun posing for pictures!!! Another day we stopped by little Munyon Island to do some seine netting along the shallow sea grass beds, and talk about how many juvenile reef fish begin their life cycles in the grass flats before moving out onto the reefs as adults. We never know what we might pull up, and that always seems to add to the excitement for the group! On this day, the lake was flat calm, the tide way out, and conditions were perfect for seineing. Everyone was excited and ready to get started, and so was I!!! By the end of the day we had caught more than a dozen juvenile barracudas, hundreds of mojarras, grunts, pinfish, snappers and tomtates. 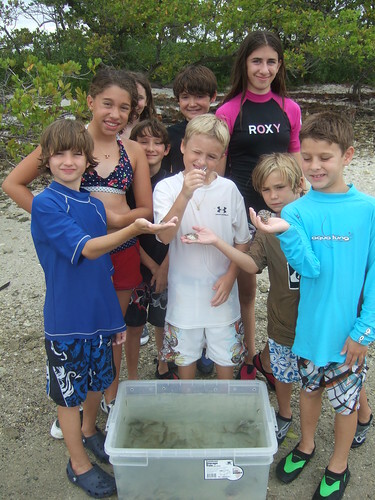 A half dozen or so big pipefish that are related to sea horses, tons of sea grass filefish that have rough skin with tiny teeth-like denticles similiar to that of sharks and lucky for the kids, a bunch of sharp-nosed puffers and checkerboard pufferfish that inflated right on demand!!! The kids loved these and we all took turns checking them out!!! It was a great day!!! We spent another morning going over to Sea Urchin Shoals and found more short spined and variegated sea urchins than you could count!!! They came in every size and color combination you could think of!!! 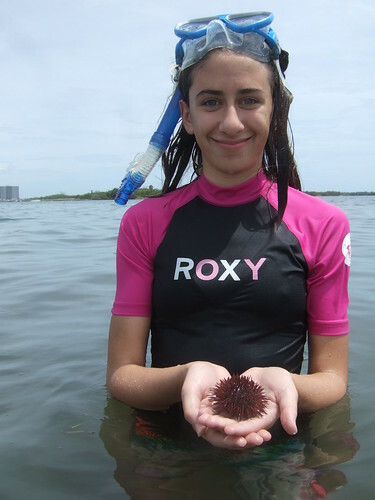 I’m not sure who won the contest that day for finding the smallest sea urchin, but I know it wasn’t me!!! And I gave it my best too! Oh well… We all took turns letting them stick to our hands using their tiny tube feet and checked out their tiny pyramidal teeth underneath, known as ‘Aristotle’s lantern”. They have the perfect teeth for grazing on sea grass, which is why we find them here in such large numbers. AdventureRachel had fun finding the perfect color she liked best! 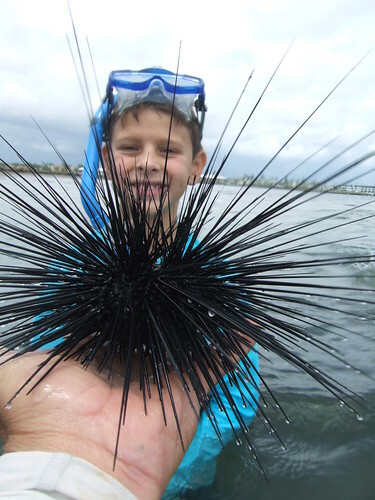 I took the kids down to a section of rocks that often has a few of the long-spined or diadema sea urchins hidden among the crevasses. I wanted to show them what another species looks like that is cool to see, but best left alone!!! These also feed on algae but usually are found on the rocks and not in the sea grass beds around here. These have long, black, venemous spines that easily break off in the skin leaving a painful puncture for an hour or so. Sometimes they can be carefully handled underneath where the spines have been worn down and dull at the tips. If you chose to pick one up, WHICH YOU SHOULDN”T!! !, be prepared to be stuck on more than a few occasions. It happens to me quite often!!! The kids sure loved seeing this one up close and personal!!! On our fishing day we started out going to the artificial reef where we caught Ceasars grunts, snappers, tomtates, pinfish, pigfish and striped grunts, NON-STOP!!! We caught so many fish that I stopped counting after a couple hundred! I have no idea who caught the most, but I can guarantee you, we had FUN like there was no tomorrow!!! I don’t think I could count three seconds before someone else had a fish on, or there was 8 fish on at once!!! One thing is certain, AdventureDavina sure had FUN catching this nice fish!!! A bit later I took the group down to my secret lane snapper hole, and we caught lane snappers there, like there was no tomorrow too!!! After about 15 minutes of catching snappers non-stop, one big ,hungry barracuda decided to park itself right underneath the boat and start having our lane snappers for lunch!!! AdventureRachel was reeling in one fine snapper when this barracuda darted out and ate half of it for lunch. She dangled the remaining half just out of water and that baracuda never took its eyes off that fish. I thought it might jump out of the water and grab it in mid air. I took the rest of that snapper and put it on a slightly bigger rod with a hook and wire leader and gave it to Rachel. A split second later, she had that big Cuda on, and a while after that, she got it in the boat!!! Way to Go Rachel!!! 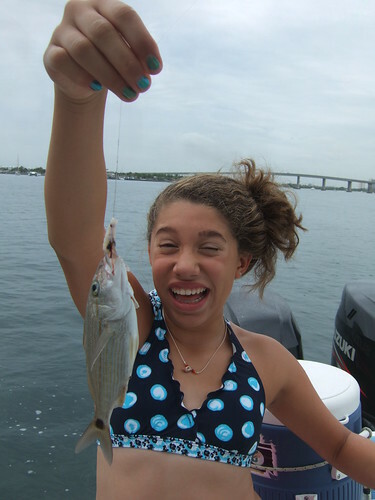 How is it, that it always seems the girls catch the biggest fish??? HMMMNNNN????? The latter part of the day we went to the Big Sandbar to swim in the Deep Hole to rinse off. We collected a bunch of florida and west indian fighting conchs to check out, and take a few photos of the kids with Rachel’s Big Barracuda, now that it was dead and safe to handle! We had so much fun we never wanted the day to end!!! When I told the kids it was getting time to go, I could hardly get them to come back in the boat. I had to threaten them that if they didn’t hurry, I was going to have to BLOW MY WHISTLE!!! And lucky for me, it happens to be one of the worlds loudest whistles!!! This day was one of those very special days, and that barracuda was one heck of a FISH!!! Way to Go Everybody!!! You guys ROCK!!! The last day we spent snorkeling around the Rock Garden, then took a quick boat ride along the beach so everyone could enjoy going “FAST”. From here we went to check the crab trap and shark line we set in the deep trough along the sea grass beds. Lotsa crabs!!! No shark!!! Oh well… But one thing very cool we did see when we went to check the line was 21, yes, that is the correct number!! 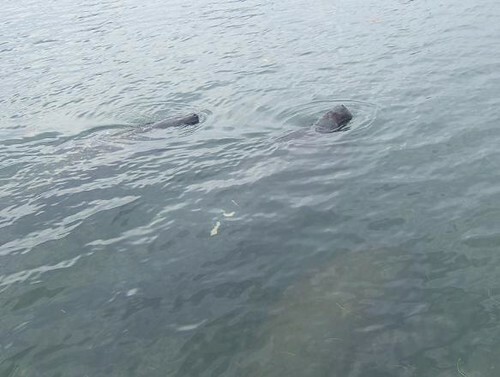 !, 21 big huge manatees eating mouthfuls of sea grass, all around the boat!!! It was fantastic!!! And we loved every second of it!!! We spent at least 30 minutes watching them munch away just a few feet from our boat!!! What a sight to see!!! It was just GREAT!!! And did we EVER want to join them!!! And while we were all enjoying this, 3 bottlenose dolphin swam by to take a close up look for themselves! They spent about 15 minutes circling our boat looking at us, while we looked back at them!!! It was a great way to end the day and our week, and a put an exclamation point on another wonderful week full of FUN and ADVENTURE!!! All the way from HERE to THERE!!! 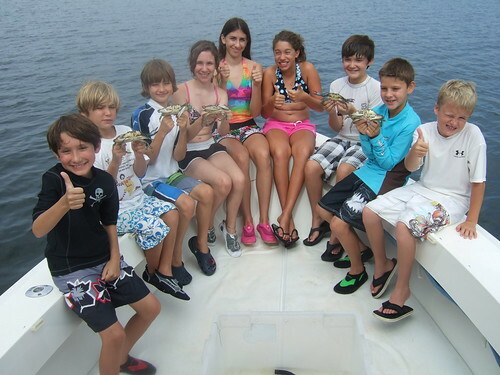 Boating, Fishing and Snorkeling FUN!!!! What a week!!! What a day!!! What FUN we had!!! It just doesn’t get any better than this!!!! I can’t wait till next week to do it all over again!!! Hope you’ll join us!!! Its going to be GREAT!!! Let’s Go Have Some Fun! 2019 Registration Has begun!!! Please Scroll Down To See Available Camp Session Dates. 2019 SUMMER CAMP REGISTRATION HAS BEGUN!!! DON’T WAIT TO REGISTER!!! 2019 SUMMER CAMP DATES. $300 per child. Have you seen our weekly photos?